If fiction were outlawed, what would be lost? This post raises the qestion whether the fictionless would know less about the world. I think so. They wouldn't have the benefit of reading Tolstoy's brilliant depiction of love and obsession in Anna Karenina, for example. So they'd know less about love and obsession. Could the loss be made up for? Could psychologists tell us everything about love and obsession that we could ever learn in novels? The task of writing a novel -- creating a detailed, believable alternative reality -- puts the writer is a unique position to see things that a psychologist might not. But it would be a bit much to pound the table and say that fiction can't be replaced as a source of knowledge. It's just not likely to be replaced. Is it really knowledge we get from fiction? One thing that makes it seem as though a reader doesn't get knowledge from fiction is that the novelist doesn't actually present the evidence that went into the construction of the story. 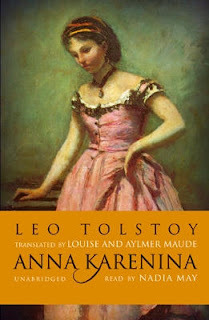 Tolstoy may have made lots and lots of observations that went into the drawing of the character of Anna Karenina. But he didn't put them in an appendix. You might say, then, that he knew what he was talking about, but we don't, as a result of reading the book. Yet this is unsatisfactory. As a casual reader of popular science books, I've come to know a lot of things. For example, I know that the rate at which animals are becoming extinct is accelerating, because I've read E. O. Wilson. Yet I have only the dimmest recollection of the evidence for that. Wilson has the evidence, but I don't. Evidently, knowledge can be transmitted from person to person without the ability to give justifications being transmitted. When we are in very fussy moods, we may not call this "knowledge," thinking of "She knows that p" as very high praise. But for the most part, we're liberal with the use of the word. Martha Nussbaum is well known for arguing that certain sorts of moral knowledge are conveyed by novels, a view I have a lot of sympathy for. Novels are uniquely fitted to reveal the pluralistic nature of values, she says. But I'm going to leave that aside, what with thinking it sidetracks into tangential issues about whether there are moral truths to be known about--and how moral knowledge might be distinctive. I learn a lot of things from reading fiction: I learn about life in early 19th century France from reading Balzac, about Saint Peterburg in 19th century Russia from reading Dostoyevsky, about the colonization of the Congo from reading Conrad's Heart of Darkness. I suppose I could get similar information from reading history, but as you say, one rarely checks the footnotes while reading history and as a result, I don't know whether the historian is giving more accurate information than the novelist. What's more, great novelists are excellent narrators, so the picture of the Congo depicted by Conrad sticks in my mind longer and in more detail than would an article on the subject in Wikipedia or even a good history book. Balzac says: "the novel is the private history of the nations". I agree. I think we do learn things from fiction.... but, to play a bit of devil's advocate here, I'm not sure that we learn the things that you're saying we're learning Jean. e.g. I don't think we learn anything about love when we read Anna Karenina. I think, instead, the fictional experience (and I don't mean the experience of reading) moves us in a way that a great many of us enjoy, and wish that we were moved by reality in the same way. So what are we learning? We're not learning something about love, but rather the fiction is making us desire something that is fictional. So when we take religion as a fiction, we find that people are becoming infatuated with the fictional love of their god, and are only met by frustration in the real world. Yes, I grossly simplified what we learn from fiction--or rather, I gave one example. We learn a wide variety of things from fiction. Maybe we also get misled by some fiction. It can teach us to want things that wouldn't really be good to have. If you start looking at scripture as fiction, you'd get freed to read it unconventionally. If Yahweh is read as just a character, I'm not sure you'd be in love with him. But in reality, of course, religious people don't think he's a character. They may think scripture is semi-fiction, but they don't think it's entirely fiction. Well let me say at the outset that I think this touches on, as Jean likes to say, a set of "first class questions." The question of whether or not we get "knowledge" from fiction depends what we mean by "knowledge" of course, and that sends us straight to epistemology--a difficult subject if ever there was one. Without running off down that difficult road however, we can immediately note that we already have a duality present in the very framing of the question. "Fiction" of course means "a story or description that is not real." If we posit that "knowledge" pertains to "learning real things," also known as "facts," then our question becomes something like "Can we gain knowledge of real things from unreal things?" Can a tissue of appearances tell us something about reality? Certainly it would seem so from Hamlet's point of view. Consider his speech to the players of his mousetrap. image, and the very age and body of the time his form and pressure. Assuming that we accept a reality/appearance distinction, and further, that reality is better than appearance, then at its best fiction "holds a mirror to nature" where by use of allegory and metaphor it helps us gain factual traction on the real world by virtue of appearances. But metaphor and allegory are very slippery things. Is Juliet REALLY "the sun?" No of course not. But she is. "Just" like it. When we find that Juliet is the sun do we gain new knowledge? Or are we gaining something else? If knowledge = facts then I do not think it makes sense to say that we have learned anything by learning that Juliet is the sun. But if knowledge can be made to include new experiences, or new perspectives: a new way of understanding of "what it is like" to BE a certain way, then I think perhaps we can say that if we took fiction out of the world we would be losing a form of knowledge. I want to suggest that fiction offers us new phenomenologies, new ways of having particular kinds of experiences and that in this respect we are looking at something that echoes the kind of epistemological issues that arise in the context of the so-called "Mary Problem." Fiction is like the color red. Without it, we live in an achromatic prison. I think that I can learn more about love from Anna Karenina than I can from any psychological treatise on the subject that I know of, that is, from a great novel like Anna K., not from any novel on the subject. What makes great novelists great is that they have a sharper eye than the rest of us and are more honest or at least clearer about human behavior than the rest of us. I don't expect psychologist to have a sharper eye or to be more honest with themselves: I expect them to follow certain scientific procedures. The novelist dares to step farther in narrating what he sees than the rest of us, including psychologists do: he or she may fall flat on his or her face or may produce a masterpiece. In fictions such as Anna and Vronsky I see love relations that I had or could have had or that I have observed in others and get a clearer vision of what romantic or passionate love is. And if you follow Harold Bloom's facinating examination of Freud in The Western Cannon he actually argues that psychology itself is a direct outgrowth of fiction, namely: Shakespeare. In other words, on a Bloomian view, you are entirely correct. Novelists are so much better at psychology than psychologists that psychologists had to go to the artists to get any psychology at all. My view is that in order to write great literature, like that of Shakespeare, the artist has to be totally realistic/honest about who he is and who others are, simply because I can't understand others if I don't understand myself. Shakespeare's understanding of human nature is implacable. That's why we use him as reference: the other day I remarked to my brother-in-law that a family was like that of King Lear. My brother-in-law replied that when he read Shakespeare in school, he thought that the plots were exaggerated, but with more life experience, he's come to realize that Shakespeare's plots are completely realistic.